Well, this is certainly fun news. 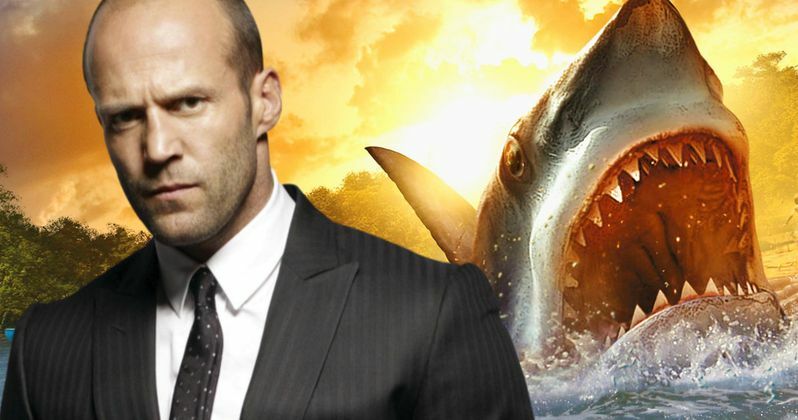 After years of struggling to make it to the big screen, it sounds like Meg is finally moving forward with one of the few men who can actually fist fight a giant shark. Yes, action icon Jason Statham is in negotiations to take on the lead in this long-gestating thriller. Meg has been lingering in development Hell for decades. But it sounds like Warner Bros. is finally ready to move on the project, with Jon Turteltaub in the director's seat. He takes over for Eli Roth, who bailed on the movie earlier this year after being attached for only a very short time. According to Deadline, Warner Bros. is producing the movie in conduction with China-based company Gravity, along with Lorenzo di Bonaventura, Belle Avery and Colin Wilson. Meg is based on the best-selling book by Steve Alten. Dean Georgaris is writing the script. The story follows one team's attempts to kill a prehistoric killer shark who has been eating swimmers off the China coast. The hunters soon discover that the shark is actually a Megaladon, long thought to be extinct. The shark is one of the largest and most powerful predators in history. It weights more than any other animal on the planet, and is 60 feet in length. Though surely Jason Statham won't have a problem tussling with this behemoth. Meg will mark Jason Statham's first lead role in a big studio film in quite a few years. More recently, he has taken a co-starring role in Universal's Furious 7. And he will return in Fast 8, which is scheduled to shoot soon. He also appeared in a support role opposite Melissa McCarthy in last summer's hit comedy Spy. He is globally known as an action star, and should bring International eyes to what is being considered Jaws in China. It was in early March that horror director Eli Roth dropped out of the project for reasons unknown. Warner Bros. was quick to assign the project to Jon TurtelTaub, who is perhaps best known for the National Treasure movies starring Nicolas Cage. Disney first attempted to turn Meg into a movie way back in 1997. Many different parties have tried to mount the adaptation since that time, all failing to succeed. Many believed that Eli Roth would finally be the force that cracked the code. But that obviously didn't happen. Warner Bros. and Gravity are hoping to ride the wave of success experienced by Jurassic World this past summer in finally bringing Meg to the big screen.